Gonzaga didn’t have its trademark balanced scoring Saturday against San Diego. 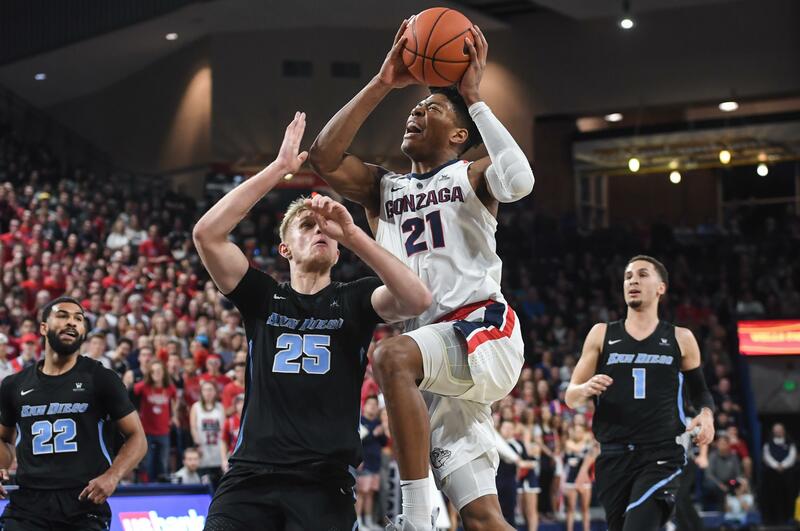 The Zags had something just as effective: a nearly unstoppable Rui Hachimura to offset Toreros scoring machine Isaiah Pineiro and a better supporting cast. Gonzaga needed all of Hachimura’s 32 points, sidekick Zach Norvell Jr.’s 21 and strong second halves from Josh Perkins and Brandon Clarke to pull away from San Diego 85-69 in front of a full house of 6,000 at the McCarthey Athletic Center. Hachimura continues to show how far he’s come embracing the physical aspect of post play. He hit a few midrange jumpers and made his only 3-point attempt, but the bulk of his damage came in the lane, including a few acrobatic dunks. Hachimura finished around the rim, a couple of times while drawing fouls on San Diego’s bigs. The 6-foot-8 forward went to the line a career-high 14 times, a season high by five, and made nine. Hachimura scored 20 of the Zags’ 40 first-half points as Gonzaga found itself in a rare battle at home. It shouldn’t have come as a surprise. The experienced Toreros (15-8, 4-4 WCC) challenged GU twice last season. They patiently run their offensive sets and they’re one of WCC’s better defensive teams. Gonzaga (21-2, 8-0) has a three-game edge in the loss column over BYU, San Francisco and Saint Mary’s midway through the conference season. The Dons and Gaels visit Gonzaga next week. The Zags already hold road wins over USF and BYU. Hachimura tacked on 12 more points in the second half to finish one shy of his career high. Defenses ruled early, but that quickly gave way to the Hachimura vs. Pineiro show. The two forwards guarded each other quite a bit, but neither had much luck slowing down the other. Hachimura was much more efficient, making 11 of 15 shots. Pineiro was 11 of 23 but nailed 5 of 8 3-pointers en route to his career-high-tying 30 points. Pineiro didn’t have much help filling out the scoring column. Isaiah Wright added 16 points, but seven came in the final 2:10 after Gonzaga had built a 20-point lead. Reserve forward Jeremy Jones did a nice defensive job on Wright in the second half. No other Toreros reached double figures. Pineiro, who hit several contested shots, made Hachimura pay for a failed attempt to intercept a pass and dropped a 3-pointer to cut Gonzaga’s lead to 48-42. Hachimura responded with a bucket inside and a free throw. USD, playing without second-leading scorer Olin Carter III (abdomen injury), was within 61-53 after Pineiro slipped behind a screen and made another 3-pointer. Norvell hit three 3s in the next 2 minutes, the last one as Pineiro was whistled for a foul on Clarke away from the ball. Clarke made both free throws and Perkins added two more to cap a 13-2 spurt. Perkins had five of his six assists and eight of his 12 points in the second half. Clarke, who blocked two shots to close within one of Austin Daye’s single-season record of 70, scored 10 of his 12 in the final 20 minutes. Norvell made five of GU’s six 3-pointers. The Zags put up their customary numbers – 53.7-percent shooting, a 38-18 edge in paint points and a 21-9 advantage in points off turnovers. It just took a little longer than usual for the assists and scoring balance to arrive. Published: Feb. 2, 2019, 9:53 p.m. Updated: Feb. 2, 2019, 10:06 p.m.